You’ll find some of the power saving utilities which are already introduced in your Windows operating system. These utilities helps you to easily configure power saving measures and you could decide to exist in power saving mode or in full horse power mode depending upon the condition. In office times most commonly, you’ll need your computer to run efficiently for better performance. While moving to home you would possibly like to keep your computer in energy saving mode. Isn’t it the helpful thing if your computer switches itself to power saving mode when you finish all your work? Now, you could simply set your profile to the computer and it will be switched automatically to the power saving mode at the predefined time. An effective solution known as PowerSlave will surely help you to do so. PowerSlave stores your configured power scheme profile with, which your computer will be switched off automatically without your intervention. This utility has a simple user interface. With this, you could simply set the Day and Night time plans according to your preferences and for that you don’t have to go through complex steps at all. 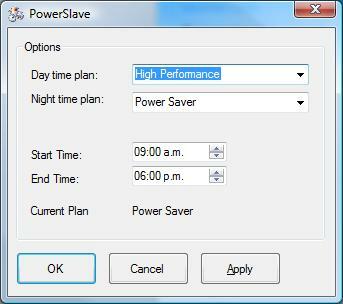 For example, you may select “Power Saver” and “High Performance” plan for day time and night time correspondingly. After that, you have to enter the ‘Start Time’ and then ‘End Time’ according to your schedule and finally click on ‘Apply’ button. To use this pretty useful application, just go ahead, download and install it using the link given Here.